The UW School of Oceanography provides each of its undergraduate majors with the opportunity to conduct research and/or independent study on a topic of their choice and to write an undergraduate thesis formally presenting the results. Students typically complete their senior thesis by completing the two course sequence Ocean 443-444 in the winter and spring of their senior year. Motivated students can complete the thesis requirements through independent research outside of the formal thesis coursework - see the appendices to this document for the forms necessary to ‘opt-out’ of the traditional senior thesis courses. For many students research is an experience with which they have little experience. Thus, it is often seen as a big hurdle and it can cause anxiety and worry. This guidebook is designed to clarify procedures, expectations and deadlines, explain options, provide resources, and reduce some of the anxiety. Your thesis experience should prove to be one of the most rewarding parts of your oceanography education. 1.To create a thesis proposal that is self-generated, written to departmental guidelines, and that undergoes at least two rounds of review by faculty and students in the School. 2.To perform independent research. If the research is conducted as part of a larger project, the individual’s research must have its own hypotheses or goals that are definable within the context of a larger research frame. 3.To provide opportunities for students to develop interpersonal skills and a sense of how individual research is conducted within a larger frame. The two examples of this used in 443/444 include group planning of the research cruise and peer-to-peer review of research proposals and reports. 4.To create a final report, separate from the initial project proposal, that is written wholly by the student. The final report is an opportunity for the student to explain how their research fits within the work of the larger oceanographic community. The final report will undergo both student and faculty review and will be made publicly available through the UW’s Digital Library (D-Space). 5.To present the results of the research in a public venue either through a poster presentation or an oral presentation. The senior thesis course 444 provides this opportunity via its spring symposium. The primary function of OCN 443 is to provide guidance for the formulation of your research proposals and for timely cruise planning of the OCN 444 fieldwork that will take place in March. The multi-faceted goal of OCN 443 is to familiarize you with strategies and methods in field oceanography, with thinking beyond the confines of your own option, with fitting into group efforts, with interpreting and presenting the resulting information, and, finally, with learning more about this year’s field site, Glacier Bay Alaska. You will have principal responsibility for selecting a research topic/goal and then planning, executing, and reporting on your work. Experience tells us that you will enjoy this unique opportunity to develop your scientific skills in a real world framework. You may have the opportunity to assist an outside agency (e.g. National Park Services, U.S. Geological Survey, etc.) 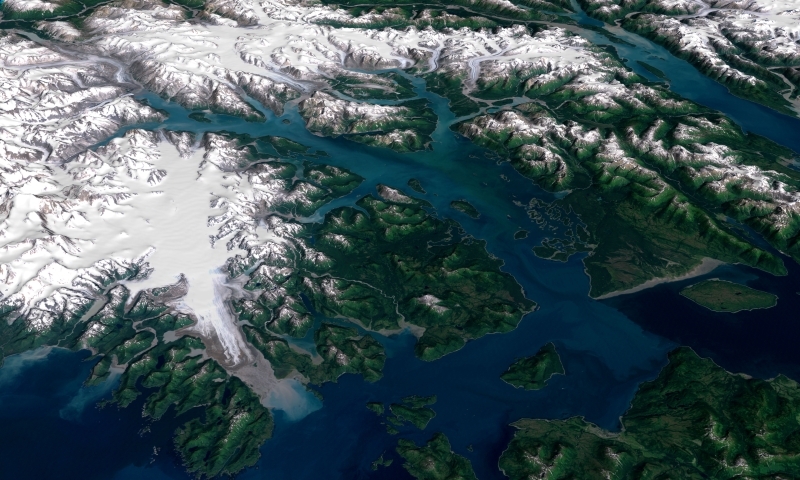 with their environmental and scientific concerns in Glacier Bay. 3) to assist in the cruise planning (schedule, logistics, etc.) for the platform(s) that will be used. The combination of background research, proposal writing, and cruise planning (OCN 443), the research cruise itself, paper writing, and the class symposium (OCN 444) is what makes this capstone course sequence such a unique, rewarding, and educational experience. Fieldwork is tentatively scheduled aboard the R/V Thomas G. Thompson 15-26 March (finals week and spring break). Careful cruise planning will be necessary in order to provide adequate research opportunities to all of the class members. In choosing your research project, we encourage you to think in terms of a team approach that crosses option boundaries. More useful insight can usually be gained if a problem is viewed and understood from multiple perspectives. This approach may also provide valuable experience as you enter the job market or graduate school. On the due dates shown above you will also be required to post the Topic Summary, Outline, and final Proposal on your web site, which in turn will be linked to the class web site. Deductions of 2 points per day will be made for late submissions. A passing grade in OCN 443 and admission to OCN 444 are contingent upon submission of an acceptable proposal demonstrating that you are thoroughly prepared for the research cruise. The Ocean 443 and 444 Senior Research Web Sites serve a broad community of interested persons, including other oceanographers, your parents, friends and relatives, and our alumni. These pages are popular and receive thousands of hits each year. Your research is something that the school is proud of and we enjoy providing a web outlet for your work. Each of you are asked to create your own personal web space for posting thesis-related documents. This can be hosted by the UW, but other hosts such as MySpace, Facebook, Xanga, etc. are also viable as long as your space is publically accessible (no passwords needed) and does not contain offensive materials. The course web pages will be linked to your personal home pages. As you carry out your research, you will be asked to post various components of the work to your home page. If you need help creating a home page, please ask one of your advisors.